How will you use Scout? The Scout platform provides great functionality at a fraction of the cost of commercial solutions. It's a perfect teaching tool for universities or companies to train students and staff on control theory, automated control systems, and explore swarm robot behaviors. The rich feature set of the Scout provides the researchers of today with the tools needed for tomorrow's success. A relatively new technology is changing the distribution warehouse. Robots zip back and forth, replacing dangerous man-operated forklifts and increasing productivity. The challenge does not yet have an optimized solution, and the Scout platform can be used to explore efficient algorithms and varied storage paradigms. Since Scout can connect to the internet, real-world server applications can also be tested in the simulation environment. The Forklift accessory has 6�+ vertical travel and slides into a compact form factor that does not interfere with the rear sonar rangefinder. The slides are spaced to allow access to the rear charging ports. 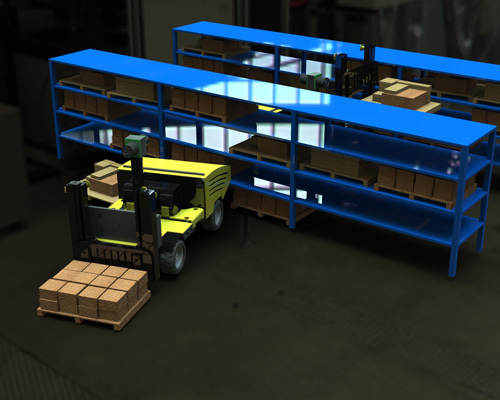 A smart accessory, the forklift has its own microcontroller that handles position control of the slide and pallet identification via an embedded RFID reader. Another area of recent automation is in excavation equipment. Most excavation is still performed by human operators, but recent work has shown increased productivity when machines are trained from productive operators. 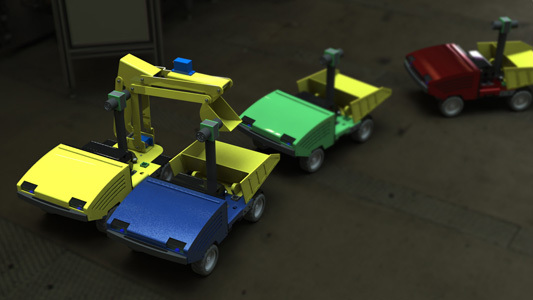 The Dig & Haul accessory is designed to develop algorithms for cooperative manipulation of objects in complex environments. Simple excavation tasks can be completed by a group of equipped Scouts. Dig and Haul consists of two cooperative accessories designed for streamlined interaction. The multiple degree of freedom digging arm has an articulated bucket for load release and folds into a compact form factor for transport. The Hauler component features an FSR load cell to measure the payload mass and signal the Digger when the maximum capacity is reached. The powerful drive motors and dump mechanism allow the Scout to deliver a payload of up to 2 pounds. "Car Robotics" is an exciting field of studies dedicated to developing next generation intelligent cars. Full scale autonomous vehicles equippped with sensors are cost prohibitive and provide a major roadblock to widespread research and innovation. The Scout platform provides tools to study autonomous movement, inter-vehicle communication, and interaction with other external elements. Scout provides full coverage ultrasonic ranging around the vehicle, independent wheel sensors for odometry and speed control, and an accelerometer and gyroscope for tracking vehicle dynamics. The vehicle simulation accessory adds turn signals, brake lights, a backup distance sensor, and a horn output to complete the package. The Scout was designed to handle indoor terrain with ease. Coupled with a fast scanning sonar array, indoor environments can be mapped for proving SLAM algorithms or exploring new locations. Multiple Scouts can be used together for even faster data collection.